While browsing through LUSH I decided to pick up a few Christmas favourites. 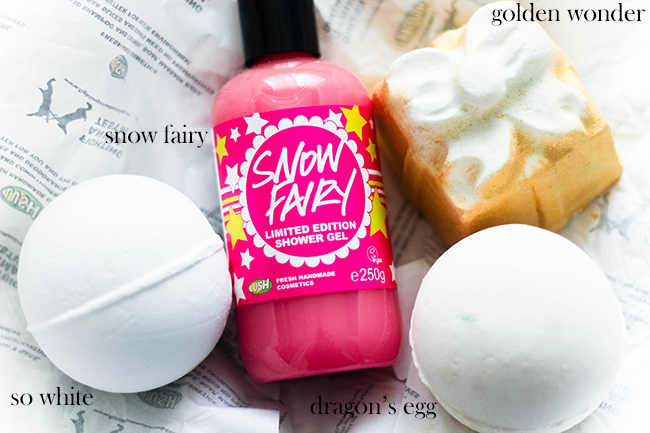 So White Bath Bomb & Snow Fairy Shower Gel while adding Golden Wonder Bath Bomb into the mix, I fell for it because it's golden & looks like a present. So White has been one of my favourites since last year and of course gutted when it finally was taken out of stores, this bath bomb doesn't add any colours of combustion to the bath but it makes the water ever so soft with a soft pink tint once the white begins to fade away. Smells gorgeous this bath bomb includes Bergamot Oil, Rose Absolute, Orange Flower Absolute & Neroli Oil. Golden Wonder looks like a cute little Christmas gift this is one bomb that the LUSH makers wanted to include their most popular perfume, they say the smell is that of light fizzing champagne cocktail with Sweet Orange Oil, Cognac Oil, Lime Oil & Cream of Tartar. It has EDIBLE Gold lustre...it's like a suppers treat in the bath, I'm not sure if I'm going to try and eat anything though lol. Last but no means least - Dragon's Egg isn't part of the Christmas mix but this is my second time buying this bath bomb after I fell in love with the glistening glitter in the water and the ring of gold it leaves once the water is drained away soak in scents of Lemon Oil, Bergamot Oil, Jasmine Absolute & Cream of Tartar. Are you looking to pick up anything from the LUSH Christmas collection? No me gusta el olor de Snow Fairy, pero las bombas de navidad son un básico en mi casa.